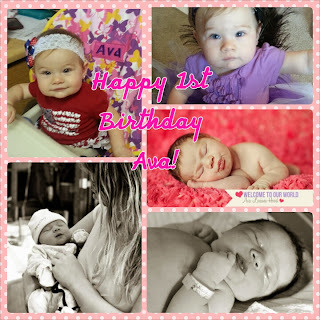 For the Love of Food: Ava's 1st Birthday Cake Smash and Favorite Things Giveaway! 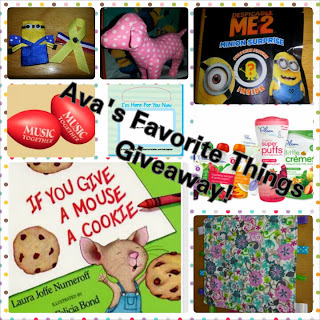 Ava's 1st Birthday Cake Smash and Favorite Things Giveaway! On October 23rd my sweet baby girl, Ava turned one. We threw her a Despicable Me birthday party back in August before her Daddy deployed but I still wanted to make this day super special for my little lady! So we spent the day with friends at a zoo safari, lunch, and then a playground play date. She was wore out when we got home but there was one thing left to do: cake smash pictures! Now Ava has never had cake nor chocolate so I knew this was going to be a fun experience. I wanted to hire a professional photographer but decided to try it myself first. I'm glad I did. Even though it was messy and I was running around trying to take 200 shots in 3 minutes, the pictures came out great. Check them out below along with my tips on Taking Birthday Cake Smash Pictures at Home. >>>>>And it wouldn't be a birthday without gifts, right? First of all I decided to give Ava a Birthday Cupcake instead of a larger smash cake. This turned out to be a smart decision since she made a big enough mess with just one of these cupcakes! I ordered Chocolate cupcakes with lavender tinted white chocolate frosting from a local lady who bakes from home, ShayShays Cupcakes . I couldn't have been more happy with the box of cupcakes she made for Ava! They were moist and fresh, had the perfect amount and perfect color icing, and she even added purple letters to spell AVA! I thought she would be timid but nope my girl just dug right in! Messy fingers are half the fun! She's mesmerized by the purple frosting! Take pictures in a place with lots of light! Outside is great or inside near a window. I used Ava's nursery because it has a large window with lots of natural light. I also used the overhead light and my flash. Use a large quilt or blanket and sit your baby on that. This was a lifesaver for me! Every crumb and frosting smear stayed on the quilt and after we were done I stripped her down and folded everything in the quilt and took it straight to the laundry room! A few sprays of Dreft stain remover and a wash and the quilt was stain free! It doesn't get any easier than that. A tip from my photographer sister in law Chelsey: do not refrigerate the cupcakes or cake the day of the pictures. This way the frosting with be soft and easier for baby to eat and make a mess with (makes for cute pictures, trust me!). Speaking of cakes, as I said above, I chose a cupcake instead of a traditional 6 inch smash cake. I think the cupcake was the perfect size. Messy but not too messy and just as fun! Also whether you order the cupcake or make it yourself remember to stick with traditional frosting. Fondant can be pretty but this is a SMASH cake. It won;t stay pretty for long and you want frosting that is tasty and easy to smush in baby's little fingers. I recommend traditional buttercream frosting or whipped frosting. Some babies are shy or timid and won't dig right in to the cake. I didn't have this problem with Ava she just dove right in (literally). But consider a test run before the big picture day. Or help baby out and smear some cake on her face and give her a couple tastes of frosting until she gets the hang of it. Consider the flavors. When my baker asked what flavor I wanted I knew right away Chocolate! Ava had never had chocolate so this was an easy decision. But then what flavor icing to use? She mentioned cream cheese but I nixed that idea. Just my opinion, but if your baby has not had sweets ever, like mine, you don't want to overload her with too many new flavors and foods in one sitting. Baby's sensitive tummy may not handle that too well. So I opted for Chocolate Cupcakes with fluffy White Chocolate icing. And it took just a few seconds for me to see that Ava is a chocolate lover just like her Daddy and me! Don't forget the cute outfit! Some people use tutus, dresses, hats, sashes, bows, bow ties, suspenders, rompers, or heck just a cute pair of bloomers or a diapers cover and nothing else! Your choice but do realize it WILL get frosting and cake on it. But I just shook the crumbs off in the trash and washed Ava's clothes right after and they were mess free and like new! Have fun! It may not go as planned but have fun! This is for baby and as long as they're happy that's all that matters! You're making memories. Enjoy it! Please comment below and don't forget to enter to win our birthday giveaway. Come back next week for a Cupcake Giveaway from ShayShays Cupcakes. Stripped down to her diaper after a messy good time! Happy Birthday baby girl! We love you with all our hearts! To celebrate Ava's 1st Birthday we are giving away a bag full of her favorite things! Enter to win below! Each person can earn up to 3 entries in the giveaway! 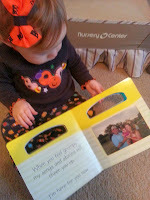 Ava loves her Mama and Dada the most so we are giving away the picture board book: "I'm Here For You Now". You can insert your own pictures into the book! Ava loves looking at pictures of her Dada in this book! Plum Organics baby food pouches and snacks. I love using my Baby Bullet to make Ava food but the convenience of there pouches and the unique flavor combos are awesome! I love that Ava can hold them on her own now too. Ava loves doggies, especially her 2 pups Charlie and Dylan. So we are giving away a pink polka dot stuffed dog! 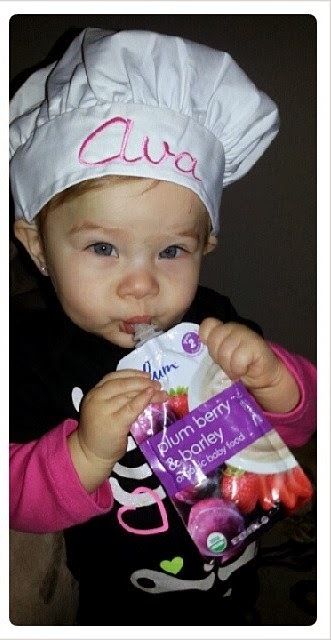 Ava almost always has a fun headband or clip in her hair. Most of them I buy handmade from different ladies online including Kraftie Kristina! We are giving away two handmade hair clips- a Despicable Me Minion Clip and a Yellow Ribbon Patriotic Clip. 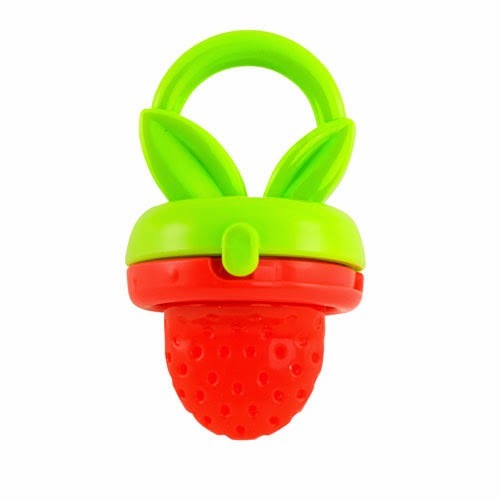 Ava has 6 teeth now and 2 more coming in so she loves her teethers especially this strawberry shapped Fresh Food Teether by Fisher-Price. We like to put frozen mango pieces in it and I love that it is rubber not mesh and super easy to clean! Every night before bedtime Ava chooses a book for me to read to her. One of her favorites is "If You Give A Mouse A Cookie" so we are giving away a copy! Ava loves music and she enjoys attending her weekly music class by Music Together of Leesville. We are giving away a fun shaker music egg! I always keep one of these in the diaper bag for Ava to play with when she is bored or fussy! Ava's favorite movie is Despicable Me so we are giving away a Despicable Me tote bag and a Minion Surprise pack! It's so hard to believe she's a year old already Nicole!!! She's so beautiful! Love getting to see her grow in photos! Tim's favorite book is "There's an alligator under my bed" Nyla Grace hasn't seemed to express much preference at this point and is still happy with anything Minnie Mouse :) As far as toys go, Tim's OBSESSED with Duplo blocks, Nyla Grace is just happy with anything we'll let her put in her mouth but especially loves her piggy toy. It's a soft squeaky pig with a clear ring filled with beads, so it makes noise and has the different textures for her to chew on, we're working on getting our bottom teeth so she's drooling like a bulldog! I love following your blog and seeing pics of Ava grow from her very proud grandfather! I have a niece coming in January and I'm sure she would love these amazing prizes! Aww! Sweet Ava! Looks like she had a grand time destroying the cupcake :) You're making me rethink using a full smash cake for Aiden now haha! one of my granddaughter's just turned 1 in August and she loves books and music. Her favorite toy is a big stuff monkey I got her. My daughter's favorite toy is her monkey blanket/rattle. My daughter's favorite toy is a small stuffed squirrel. Your daughter is looking so adorable and too cute in these photographs. Photographs would be more better if there is strong flashlight and some shiny and bold colored dresses. These are the candid photographs and the babies are too tough to be controlled. If you tell them to smile, they will not smile. They will think something else and would look surprised. It would be better if you use a certain theme and a beautiful background.